The Horse Colour Wand Mod, a simple but effective mod that does exactly what it says on the tin. Isn’t it annoying that sometimes you just don’t like the look of your horse. Maybe you want to change the colour, of the texture, well now with this mod you can do just that. Create the wand and right click on a horse to magically alter its appearance! To use the Horse Colour Wand Mod you first of all need to download and install this mod with Forge. Then, once you open up your game all of the mod’s features should have already been automatically updated. The mod is currently available with Minecraft 1.8, so therefore should install very easily. 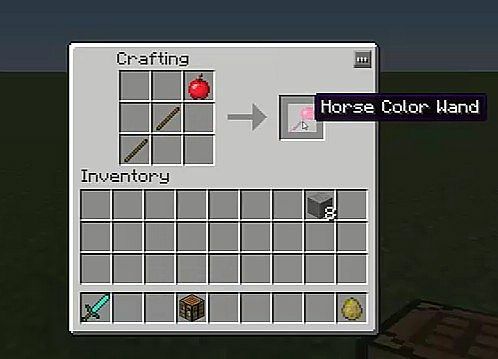 The Horse Colour Wand Mod allows you to magically change the given texture of horses with a simple click! You can craft the Horse Colour Wand with two sticks and an apple on the end. Then, right clicking on a horse will automatically change the texture of the horse. The mod can be installed for servers and client single player. Next, download the Horse Colour Wand Mod and drag and drop the .zip files into the ‘resoucepacks’ folder. There are currently no public changelogs for the Horse Colour Wand Mod. The developer released all of the features for the mod upon initial release so I can’t really see him updating the mod any further. The mod is so small that there is nothing left to add.